Do you love hummus as much as I do? 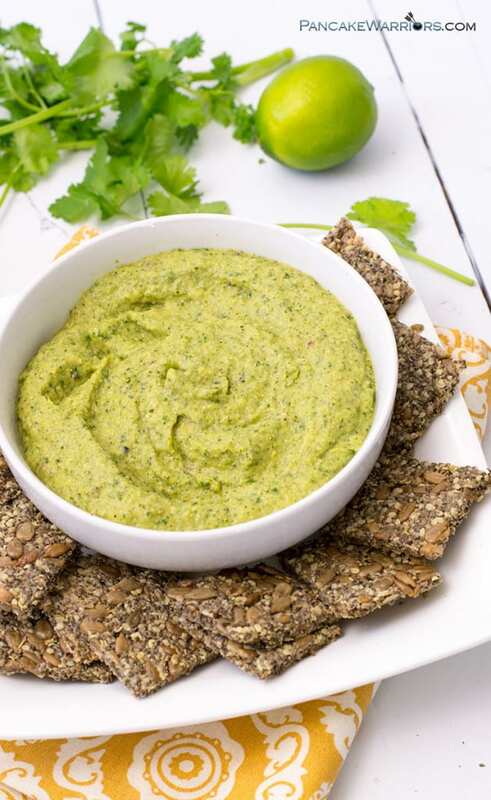 If so you are going to love this paleo avocado zucchini hummus! It’s grain free, gluten free, vegan, paleo, whole30 approved and PACKED with fresh veggies. Oh and it’s the perfect replacement for guacamole or hummus in your favorite dishes! Lately I’ve been pretty blessed. I’ve had the opportunity to speak with so many wonderful women in person at a number of live events over the past few weeks. 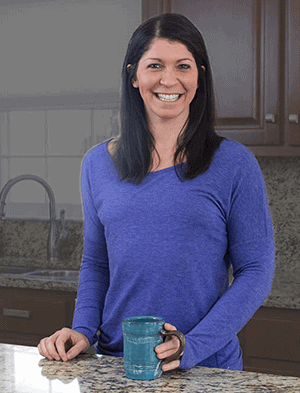 What I’m learning is that everyone is looking for quick and easy healthy snacks. Another thing is that people are trying to get more and more veggies into their diets. Well I’m fulfilling those two needs with this yummy paleo avocado zucchini hummus. It takes about 10 minutes from start to finish to make since you do need to cook the zucchini a bit first, but the end result is well worth it! If you live in the Charlotte area and would be interested in having me come talk about fitness or nutrition to a small or large group, please feel free to contact me! I’d love to connect! 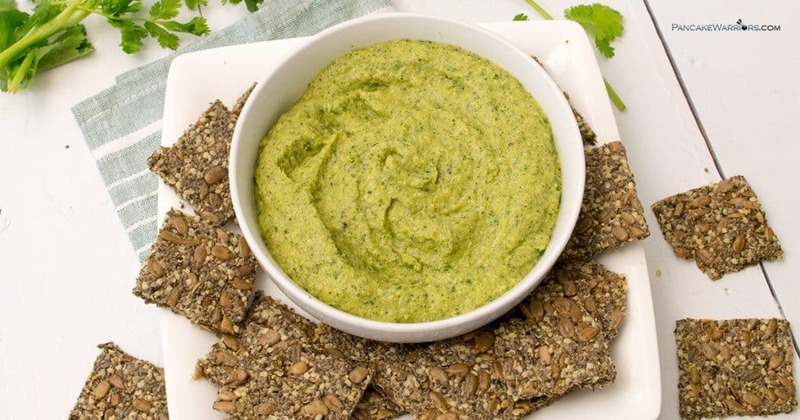 This paleo avocado zucchini hummus would be perfect to dip fresh cut veggies in for a snack. It would also be amazing on a salad or on a wrap for lunch. I’ve personally been enjoying it with homemade no grain crackers (pictured). They are very similar to these sunflower pumpkin seed crackers, and omg it’s the best snack ever! Sometimes I get a crunchy craving that veggies just can’t satisfy. Lucky for me I always have a fun recipe or two up my sleeve! 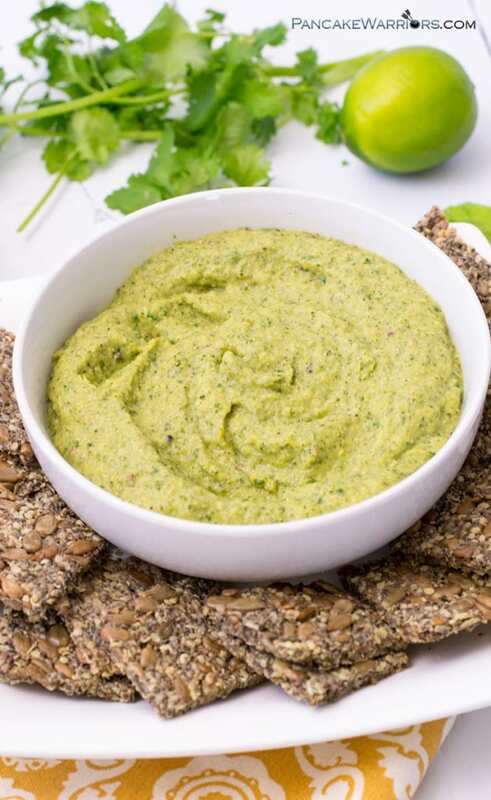 I used some of the my go to guacamole flavorings in this paleo avocado zucchini hummus and I have to be honest, this would be a great way to get more veggies in your burrito bowls or even served with salsa and chips. It’s a little bit thinner than thick guacamole, but it has all the same yummy flavors and it’s just as bright green! So if you are looking for ways to get more green food into your little ones and they love guacamole, this might just be the recipe for you! I’m personally a huge fan of zucchini, but Dave, well not so much! But but but, he even loved this! He thought it was pesto at first and gave me a pouty look “Why do I need to taste more pesto” but I assured him it wasn’t pesto and he exclaimed “No this is really good”. Dave doesn’t love fresh garlic at all, so pesto really doesn’t do much for him. Luckily I quickly sauteed the garlic in this paleo avocado zucchini hummus so he was happy to chow down! To make this dish, you will need a food processor or high speed blender. Once the zucchini is done cooking you literally just throw the rest of the chopped ingredients in the food processor and let it go until everything is smooth and yummy. You might need to stop and scrape the sides once or twice but that’s ok! Check out how easy this Paleo Avocado Zucchini Hummus is to make in the video below! 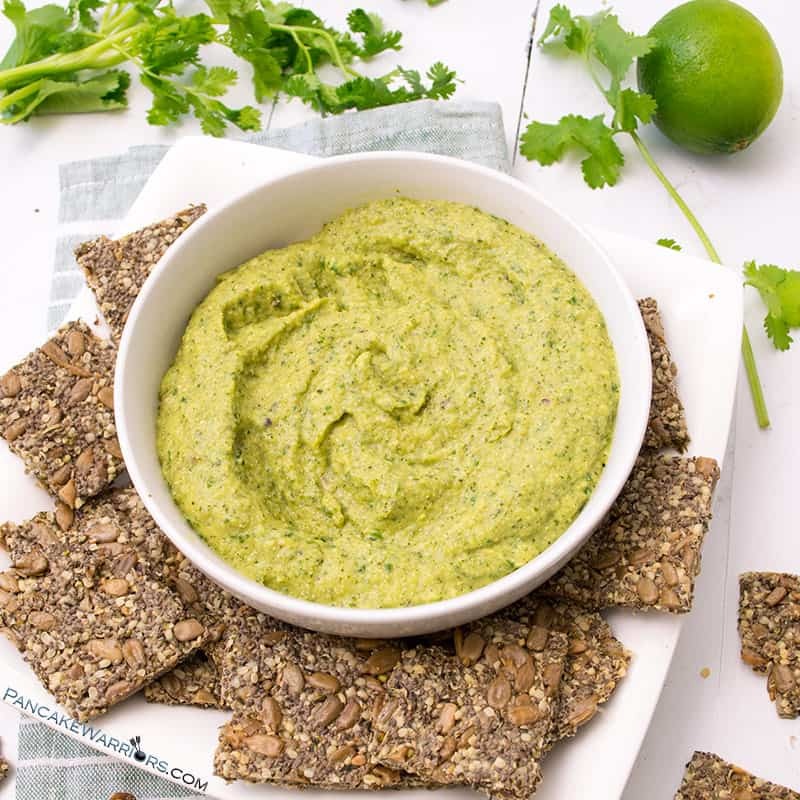 This paleo avocado zucchini hummus is the perfect snack! Packed with veggies, this goes well with fresh cut veggies, chips, crackers or even on sandwiches or wraps! 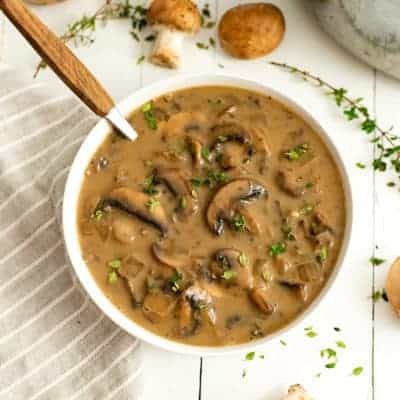 Gluten free, vegan, paleo, whole30 and super simple to make! Place a large saute pan over medium heat, spray with non-stick spray and add zucchini half moons. Cook until softened and lightly browned, about 5-6 minutes. Chop 2 garlic cloves and add that to the zucchini with a tiny pinch of salt. Take the zucchini off the heat and add it to the food processor. To this add the lime juice, half avocado, salt, hemp hearts, garlic powder, fresh cilantro, fresh parsley and red onion. Turn on the food processor and puree until smooth, scraping down the sides with a spatula if needed. Serve with crackers, fresh veggies or on your favorite sandwich, wrap or salad! 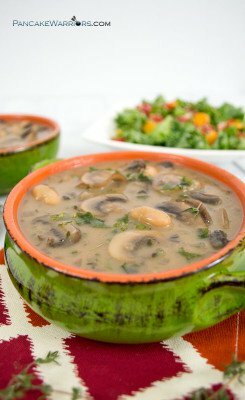 Do you have a hard time getting in enough veggie everyday? Have you ever made your own hummus at home? Hi Sam. I think hummus is one of the best foods ever created. Shared the goodness everywhere! I love health dip alternatives, and yours look really yummy. We like herbs and spices, so I need to try this one! I do love Hummus!! And this recipe sounds amazing!! Thanks for sharing on My 2 Favorite Things on Thursday!! Hope to see you again tomorrow!! Pinned!! It’s so cool that you are speaking in public. I’d love to read more about that! YUM! Never thought to add zucchini in hummus. This looks so so yummy! This is briiiilliant! 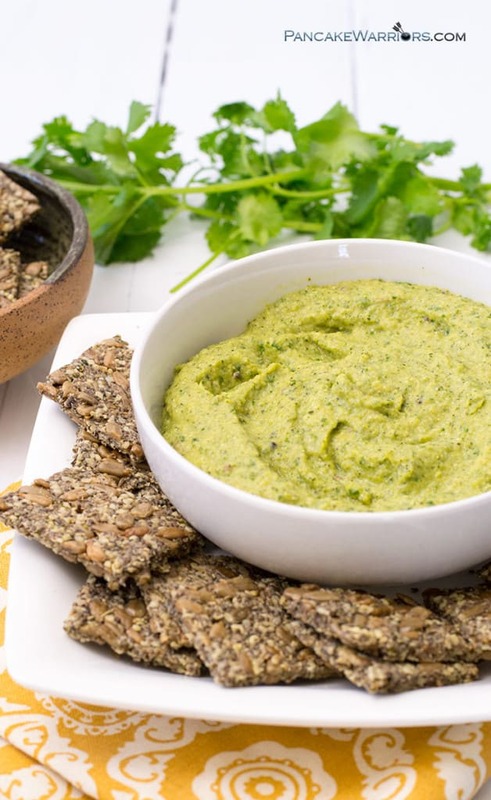 I never thought to make paleo hummus and love how full of nutrients this dip is! I’d definitely addict myself to it knowing it’s so healthy. Bravo, m’dear! This looks really delcious…as do your crackers. I could do with it for lunch! Yum, I love avocado and hummus so this sounds like a winning combination.Thanks for sharing with Small Victories Sunday Linkup. Pinning to our linkup board and hope you found some great posts to visit this week! This never came up in my feed! I knew I was missing your posts! But…anyway….I love it! All green and good with the avo and zucchini! I love zucchini too, Sam. I just want to reach into my computer and grab one of those crackers and dig in. Great idea! I love this change up! Ok LOVING this!!!! I’ve been looking for a new DIP recipe that I can smother all over veggies and chicken. THIS IS IT!! I have never tried zucchini hummus, what a great idea!!! This looks SOOOOOOOOO good! Definitely the perfect hummus alternative for anyone who can’t have legumes! 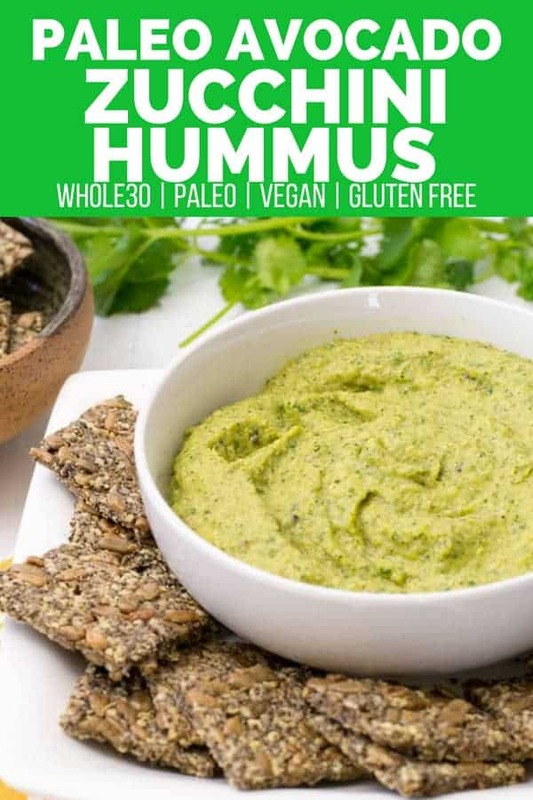 Hummus was yet another reason I could do paleo, besides all the meat since I only do limited eggs and seafood but have debated doing a Whole 30 version. This sounds amazing, can’t wait to try it! I feel the same way about needing veggie-packed snacks. I tend to resort to something sweet but it’s so much better to get something green. This looks like a delicious way to do it. I love that you hid some zucchini in there! What a great recipe. Always trying to include more veggies anyway I can! The crackers look amazing as well.